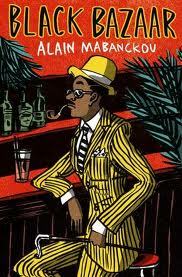 I dedicated August to reading the four Alain Mabanckou novels that have been translated into English. The final novel I read was Black Bazaar, (published in French in 2009 and translated into English in 2012). This review is coming in much later than I would have hoped, but I finally got the chance to finish reading Black Bazaar. Unlike the first three books I read, which were set in unnamed African countries (possibly Congo-Brazzaville where the author is from), Black Bazaar is set in Paris and presents the African immigrant experience in France. Also there are full stops, paragraphs, and sentences begin with capital letters (just in case you read Broken Glass and Memoirs of a Porcupine and really couldn't get into that style of writing). Our narrator, Buttologist (he can describe a woman's character just from her behind), works at a printing works and has lived in Paris for fifteen years. He is currently living in a small studio he and his ex-girlfriend, Original Colour, used to live in. This was before Original Colour left him, with their daughter, for another man - the Hybrid. Buttologist is a sapeur (a member of the Society of Ambience-makers and People of Elegance), who can tell you about a man from the way he knots his tie, and spends time at an Afro-Cuban bar with other African immigrants in Paris. He is also an aspiring writer. Black Bazaar is his journal on everything - his relationship with Original Colour, his experiences with his racist neighbour, the 'Arab around the corner', his time at the Afro-Cuban bar with his friends, and even his view on colonialism and post-colonial Africa. Black Bazaar really is about an African immigrants experience in Paris, and we get to experience that through Buttologist and the people he knows (or meets) and the places he goes. I don't know much about being an African immigrant in Paris, but I found it very interesting to read about it. I also loved the dialogue Buttologist had with different characters in the book, especially his racist neighbour and the 'Arab around the corner'. Overall, a thoroughly enjoyable read and Alain Mabanckou has found himself a new fan.